VeloPress is pleased to announce the publication of The Athlete's Guide to Yoga: An Integrated Approach to Strength, Flexibility, and Focus by Sage Rountree. The book is now shipping from VeloPress and VeloGear and will be available in bookstores and bike shops this January. Endurance athletes can now gain the benefits of yoga for training and racing in 2008. Yoga makes good athletes better. This time-honored discipline imparts flexibility, balance, and whole-body strength, creating improvements in an athlete's form, efficiency, and power. In addition, yoga's attention to concentration and breath awareness improves mental focus and mental endurance-hidden assets that become especially important at the end of a long training session or race. Rountree's applications for training and racing ease the introduction to yoga, making it practical and accessible for all athletes. "The Athlete's Guide to Yoga is a great resource to get you on the path to better training and racing." "Finally, we have an explanation of how to integrate yoga practice into daily training and within different training cycles. I've been practicing yoga to complement to my triathlon training for the past 8 years. Now I have a great tool to take on the road when I can't make it to my usual class." "After running and racing for nearly thirty years, competing through five Olympic trials and the 1996 Olympics, and traveling the world on U.S. track, road, and cross-country teams, I thought I knew all the tricks for success and longevity in distance running. Yoga helped me set a world age-group record in the indoor mile and an outdoor American record in the 1500m at age 45. Yoga should have been-and will be from here on out-added to the mix of ingredients for success for any serious endurance athlete. Incorporate the practice of yoga into your weekly training regimen, and it will make a difference in your life as an endurance athlete. 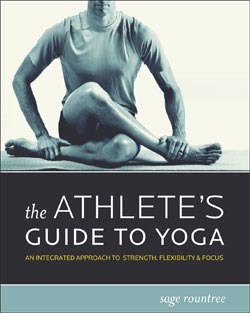 I highly recommend The Athlete's Guide to Yoga to all athletes who want to train smarter and race faster." "Yoga is not only good for athletes-it is essential, for both the physical and mental benefits. Sage shares the benefits that yoga has brought to her life as an athlete and offers easy to follow yoga postures and breathing techniques to help athletes of all sports get started with a safe and effective yoga routine and to help them avoid or rehabilitate an injury." "The Athletes Guide to Yoga gives a profound outline for training for peak performance at the highest and most integrated level. It's a wonderful book and Sage is a gifted teacher!" Sage Rountree is a Yoga Alliance registered yoga teacher with coaching certifications from USA Triathlon and USA Cycling. Her popular yoga classes draw all levels of athletes, from recreational walkers to Ironman triathletes and Olympians. Rountree has published articles on Yoga Journal Online and in Running Times, Inside Triathlon and Endurance magazines. Rountree's yoga podcast videos are available for download at www.sageyogatraining.com.